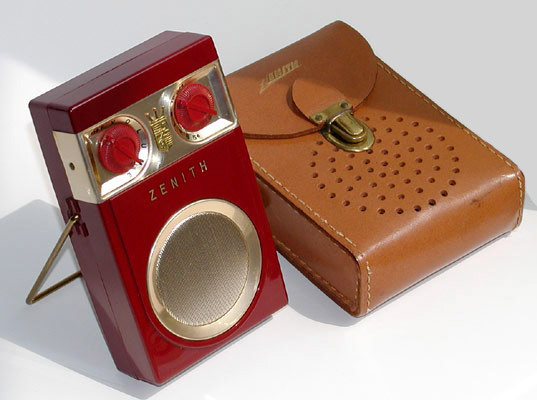 Zenith's first transistor radio has earned the respect and admiration of collectors around the world for its good looks, good sound, and historical significance. In my book it is also one of the all-time great American transistor radios. The Royal 500 is often referred to as the "owl eyes" radio because of the design of the volume switch and tuning dial. Here you see the original hand-wired version from 1955, distinguished by the bars that extend across the volume and tuning knobs, the stylish wide bezel speaker grille, the large corporate "crown" logo between the dials, the "ZENITH" name printed up close to the escutcheon, and internal features you will see on the next pages. The Royal 500 sports a rugged nylon cabinet, and this first version was available only in maroon and black. Also shown in the photo is the leather carrying case, which includes a nifty earphone pouch on its back. Note: Bob McGarrah offers thorough coverage of a variety of revisions, including the earliest version with the "circuit #1" board in it on his site. Those interested in the model won't want to miss it!